This Fields of Gold tapestry shows a Mediterranean scene filled with bright light and flowers, the work of artist Robert Lombardi. The works of Lombardi focuses on the Tuscan Mediterranean landscapes and his works are infused with a soft and natural light. 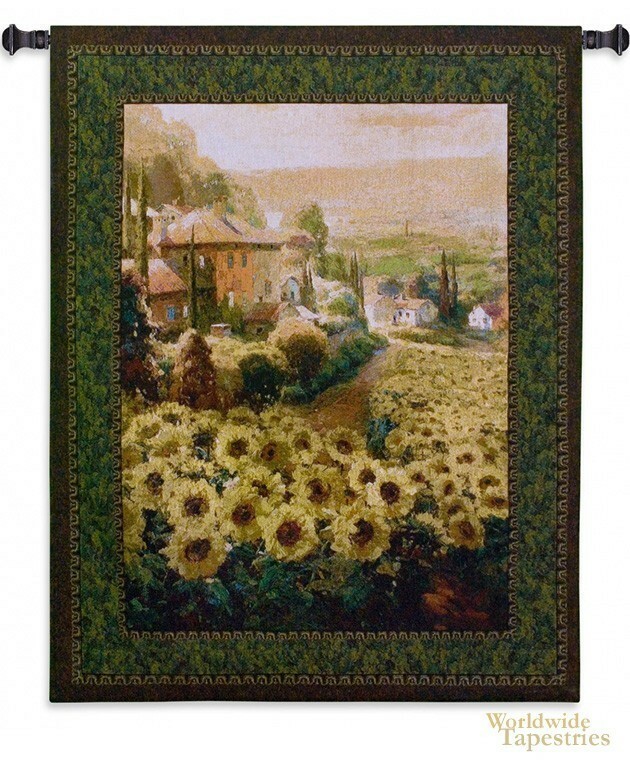 In this tapestry we see the countryside of the Mediterranean with distant hills and villas surrounded by poplars and a multitude of sunflowers in full bloom in the sun. The use of light is beautiful and reflects the beauty of the surroundings. This Tuscan landscape tapestry "Fields of Gold" is backed with a lining and has a tunnel for easy hanging. Note: tapestry rods and tassels, where pictured, are not included in the price.